you keep getting these emails, please add tim@twineagles.org to your address book or whitelist us. Having trouble viewing this email? View it on the web here. Hello from Twin Eagles Wilderness School! The summer heat is here! Everyone and everything seems to be seeking respite from the heat via shade trees or cool water. Huckleberries and bunchberries are ripe, fawns are growing large yet still have their spots, bucks are in velvet, and yellow jackets are swarming. Our summer season has been full on as well. We've had over 200 kids attend this year's summer camps, with countless stories of deepening connections with nature, building new friendships, and increasing self-awareness. Take a look at our summer camp update below for more! Twin Eagles co-Founder & co-Director featured on the Ben Greenfield Fitness Podcast! 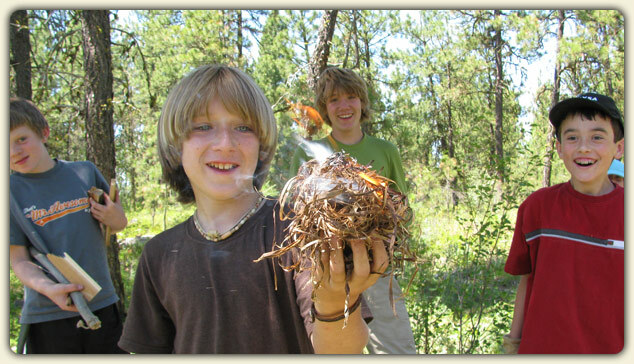 Twin Eagles Wilderness Adventure Summer Camps are thriving this year! We've already had hundreds of kids exploring rivers, sloughs, meadows, ponds, forests, and creeks, celebrating the glory of summer as they learn real skills like bow and drill firemaking, natural survival shelters, healing medicinal plants, and bird language skills. All of this, of course, held in the container of our nature based mentoring culture including spellbinding storytelling and songs rich with lineage. They have taken a journey of awareness and connection, resulting in joy and gratitude as they come home dirty, exhausted, and deeply satisfied. We have just a couple summer camps left this season, take a look if you're interested, and sign up now while there is still space! "This was the single most impactful camp my son has ever been to. He not only learned meaningful wilderness survival skills but he also grew in his connection to nature, his peers and himself. He really connected with the staff and I was grateful that they modeled the character traits we are always trying to instill in our children. I highly recommend this camp!" "My 8 year old daughter had an amazing week at the Wilderness Survival Day camp in CDA. The instructors were very knowledgeable, professional, and kind. The program is very well run and my daughter will be returning next year." "My son has been to so many camps and this one was his favorite. He is still carving with his knife, talking about his camp friends and researching how to get the supplies he needs to build a fire. I will be sending him back!" "My 10 year old son just finished his first overnight camp. This program is excellent. The combination of skills, team work and mentoring is not usually found in kids programs. We are so grateful that are children are able to participate. Highly recommended." Day Camps for Kids - for ages 6-13 - with themes! Nature Adventurers Day Camp - Mystery and adventure await all those who heed the call of the wild. Have you ever looked out onto a wild landscape, and imagined all the possible natural adventures, just waiting to be experienced? For full information on our summer camps, check out our Twin Eagles Summer Camp web page here. Last month I (Tim) was featured on the Ben Greenfield Podcast. Ben is a paleo fitness expert, author, and podcaster who is also happens to be a good friend. He has trained with me here at Twin Eagles, and sends his twin sons to our camps each year. During our podcast we spoke about vision quests, rites of passage, and how the human search for purpose in life intersects with nature. It was a lively discussion, with lots of fun stories and insights. Ben grilled me with questions, which I happily ate up! Lots of folks are reporting that is was a great podcast, so feel free to check it out if you're interested: Listen to this special podcast here! Join Wildlife Photographer, Author, and Filmmaker David Moskowitz for a two-day clinic on Wildlife Tracking in the greater Priest Lake/River area. This course is hosted by our friends at the Selkirk Conservation Alliance. From the tiniest shrews to bears and cougars, the signs of wild animals are around us year-round, waiting to be discovered by the observant outdoor adventurist. Humans’ unique ability to find, interpret and follow the tracks and signs of wildlife is a skill that has been a fundamental part of our relationship with the natural world from the beginnings of our species. Tracking skills, found in the traditional ecological knowledge of many cultures around the world, continues to be a fundamental field skill in contemporary wildlife research and management, hunting, recreation and environmental education. 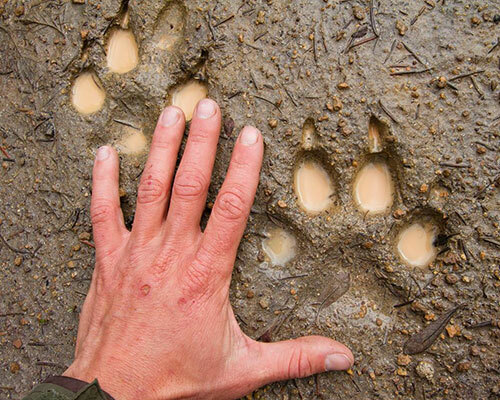 Learn more about the Fundamentals of Wildlife Tracking Course with David Moskowitz here! Twin Eagles Wilderness School respects both the privacy and time of our subscribers. We will not sell, rent or otherwise share your e-mail address or other personal information to any other person or company. This eNewsletter will be sent out approximately once per month, occasionally more. Our eNewsletters always contain an easy way to unsubscribe at the bottom of each email. Track us down on Social Media! We invite you to like, follow, comment, and share about us on these social media sites. This is a great way to stay connected and help forward the vision of deep nature connection mentoring. Thanks!